OK, here is my first and hopefully not last.......Instructable!!!!! My name is Steven K Smith and I am a freelance illustrator turned prop maker living outside KC, Missouri. This demo will detail my full build of the dragon helm from Bio Ware's highly anticipated video game Dragon Age Inquisition. I will show you the process from concept and sculpting to molding and casting. When you start to think about making a prop from a video game, movie, etc. Always try and find as many reference images as you can. That being said, at the time I built this helmet there were 4 images on the web and the game was 10 months away. Regardless, the images I did find were pretty good and what I couldn't see I just used some artistic licensing. 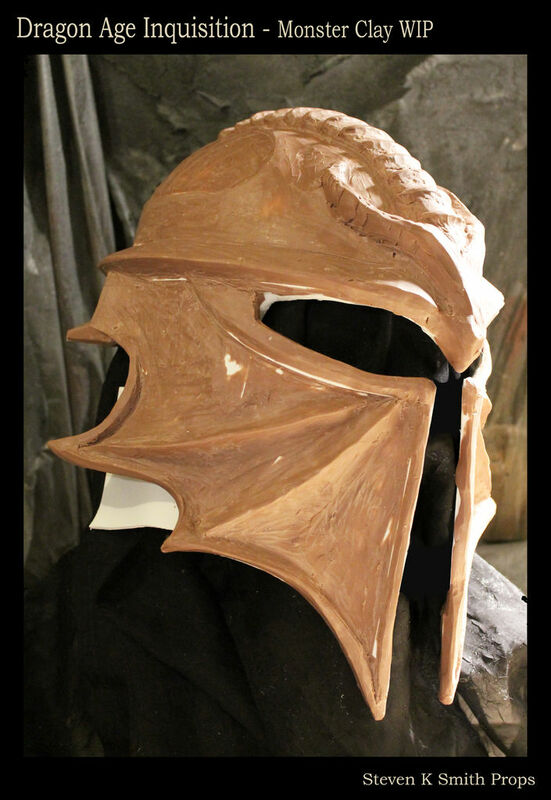 For this build I decided that I was going to sculpt the entire helmet. Knowing that the clay would start to get a bit weighty, I decided to build a structure out of Styrene for support. I cut out and heat formed the styrene to the basic shape of the helmet. This provided a good solid base for the clay build up. Ok, so I built my styrene structure. Now it is time to start adding clay to the base. I like to use "Monster Clay" for my builds. It's easy to work with and will not mess with your silicone mold later on. Basically at room temp it is fairly hard (great for detailing). A heat source must be used to make it malleable. I have a small convection oven in my shop that I use to melt down the Monster Clay. Once the clay is soft I started applying it in small clumps to rough out the basic shape of the dragons wings and the crest. You can see by now I have covered almost all of my styrene with clay. This will allow me to add and subtract till I get the desired shape. The wings are getting flushed out and the dragon on the crest of the helm is being roughed in for scale. Up until this step I really haven't used any sculpting tools. Tools will tend to make you want to detail, which I admit is the best part. But until you have the scale correct you may waste a bunch of time detailing a section that will have to be redone. Sculpting Tip: Use multiple light sources. That way your not sculpting with a light on one side and then realize that you are totally off because of the shadows. Here is the fun part. I spent a whole day trying to work out the dragon's head for the crest. I sculpted this thing 3 times :) I wasn't really feeling the game accurate version so I decided to make a mix of theirs and my own. Beads were inserted into the clay to center the eyes. After that I used various dental tools to rough out the shape then go back in and fine tune the look. To make the finished product look like it could have been cast iron I used a heat gun to "melt" the surface. Like any other detail do not use the heat gun to much. It can literally melt away a lot of your hard work. Here is where you take your beautiful helmet and destroy part of it in the name of "battle damage" I just decided where aesthetically a scratch, ding, or notch would look cool. I also finished the spike mohawk along the top of the helm. For the spikes I cut and sanded down some oak, that I will cast separate. You definitely want to wear eye protection, a respirator, long sleeves, and gloves from here on out. So my helmet is now fully sculpted and looks pretty badass in my opinion. Next we move onto the jacket mold. I will be honest I do not enjoy mold making. But you don't want to spend a ton of time on a beautiful prop and have a bad cast thanks to a sloppy mold. Clay is walled around the outside of the helmet and well as the eye and mouth openings. Nothing is more rewarding than pulling your first cast. You get to see hours of hard work start to pay off. I use Smooth On 65D to roto/slush cast the helmet. Now that the helmet is out I move on to cleaning up the cast. The workhorse in my shop is my Dremel. It is great for cleaning up all of the extra bits of resin from the cast and smoothing out the interior. Painting is where your prop goes from just a piece of plastic to "BAM" I always start with a primer on the rough cast. From there I will use a mixture of different rattle cans to setup a base coat. For this build I used 3 different krylon metal finishes before I moved onto the acrylics. I prefer to hand paint all of my props. Nothing makes it pop like adding some acrylic washes and then drybrushing the highlights. I really tried to get creative with the photo shoot for this helmet. I live in Missouri where it is bright and sunny one day and 5 inches of snow the next. That did give me the opportunity to have a couple of different backdrops for planned out concepts. I hope you enjoyed this build!! I was with you until we got to the molds... I don't suppose there's any way we could get a little more detail on those? Pleeeeeeeeeeeeeease? Really nice made helmet dude. But a question is the styrene helemt top made of styrene to? And if it is how did you make it sooo round? And if it isn't then what is it made of? The dome that the styrene is attached to is resin cast. I actually used the mold from my dead space helmet to make the top and then attached the styrene to it. The "I made it" tag should be removed. I dont think anyone can replicate this.... Good Job!! omg it was awesome ,but i dont think i can do something like that ! Gee, I was really hoping that your instructions would be written for the novice. I have no idea how to source, cut or heat form styrene. Since you say this is your first Instructable, I'm assuming that you haven't written a separate tutorial for this step. My feedback is that you need to dumb it down for the novice. Those who have more experience can just skip over the steps they already know how to do. True, but sometimes these high level tutorials are helpful too. I look at these more as a "Oh, that's what the heck that's made from," kind of help. You've got to start somewhere, and sometimes it's just demystifying the materials and the general process. I'd rather this artist share some of his process than not share anything because he doesn't have time to break down each step to a very granular level. Gorgeous. I look forward to your future instructables.